Of Owen Sound, and formerly of Sauble Beach, at Lee Manor in Owen Sound on Sunday, December 22, 2013. 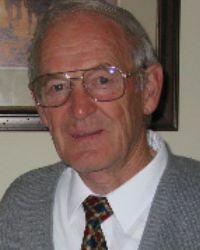 George Robert “Bob” Black at the age of 83 years. Loving husband of Norma (nee Loughran). Devoted father of Jack and his wife Lori, of Waterloo; Bill and his wife Mary Ellen, of Owen Sound; Ron and his wife Kathy, of Parry Sound; Carol and her husband Dave Abernethy, of Calgary; and Dianne and her husband Joe Schouten, of Mount Forest. Cherished grandfather of Carla, John, Genna, Peter, Robert, Krista, Shannon, Shalice, and Joe. Brother of Jack (Velma), and Olive Roberts, all of Fergus; Fred (Delores), of Holstein; and Mary (Val Glenn), of Mount Forest. Brother-in-law of Elizabeth Black, of Owen Sound; Dorothy (Bob Christopher), June (Ken Baker), and Isabel (Ernie Freeman), all of Guelph, and Ralph Loughran (Louise), of Whitby. Predeceased by his parents John and Cady (nee Winton); and his brother Jim (November 2013). Family ask you to gather with them for visitation at the Thomas C. Whitcroft Funeral Home & Chapel, 814 Bruce Rd. 8, Sauble Beach (519) 422-0041 on Friday December 27, 2013 from 12-2 pm, where a service will be held in the Chapel at 2 o’clock. Reception to follow. Spring interment in Zion Cemetery, Hepworth. Donations to Alzheimer Society of Grey-Bruce would be greatly appreciated.